This year The Air Museum – Planes of Fame celebrates its 50th Anniversary. Ed Maloney, the museum’s founder is responsible for saving a large number of extremely rare warbird aircraft. Scott Germain met with him to hear his story and his vision for the future. A volunteer effort at Planes of Fame will return a Bell P-59 Airacomet to flight. 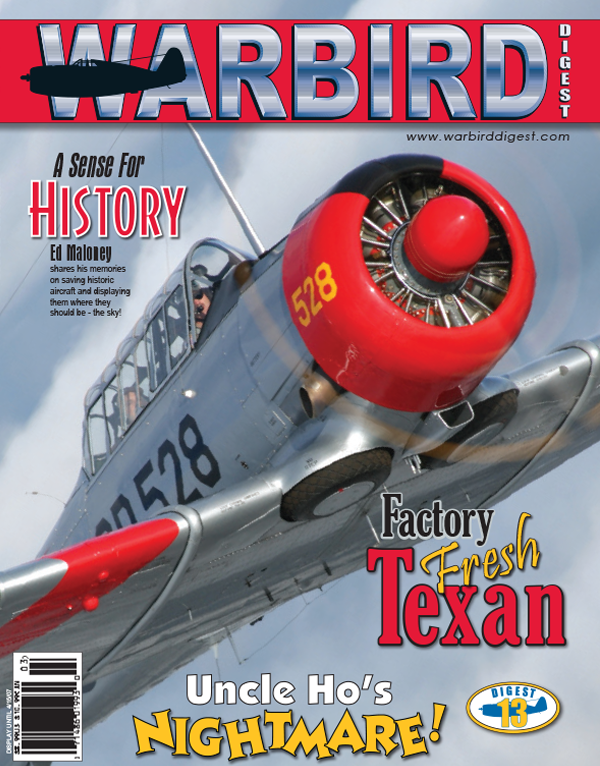 Warbird Digest met with the workers and reports on the status of the project. After an immense restoration effort, Gary Allen’s AT-6D is back in the air. Tim Savage visited with Allen to find out how he managed to create a nearly stock example of the popular Texan. After walking away from a B-25 in 1945, World War Two veteran Joe Miller undertakes the restoration of an L-3 and returns to aviation. Rich Wallin details this remarkable story. In the first part of our of review of Skyraider survivors we cover the early models of the mighty attack aircraft. Like many warbirds, the Skyraider can trace its survival primarily to foreign air arms. After our story on Tempus Fugit in the last issue Connie Bowlin provided Warbird Digest with some interesting history of the Mustang. A popular internet site focused on warbirds sparked an effort to rescue a PBY Catalina that was in immanent danger of being scrapped.